Its quite simple. 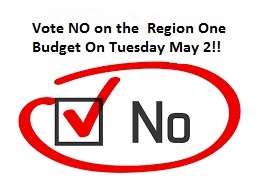 To retain ANY leverage with a stubborn BOE and administration vote NO today in the Region One Budget vote. Pressure must be brought to show we mean business. This is your only recourse to get your feelings across. A NO VOTE on the budget May 2 could save us thousands of dollars in legal fees downthe road….